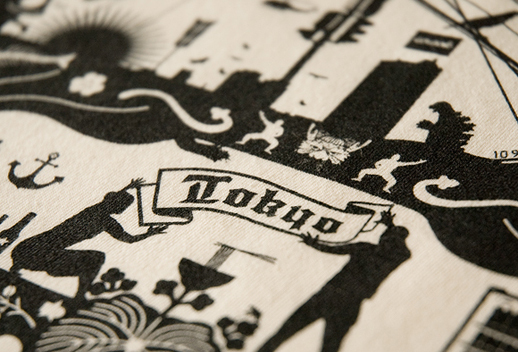 2 duos of artists and designers, one from Japan and one from Switzerland but based in Tokyo, share their intricate views of the city that we love with 2 new great TAB T-shirt designs. So+Ba is Alex [So]nderegger + Susanna [Ba]er, a Swiss duo that has been working in Tokyo for more than 10 years. They are active in the field of graphic design, art direction and VJing, and they teach typography at Tama Art University. Pingmag has a lengthy interview with them, a must-read! For TAB, they created a design inspired by the traditional silhouetted paper cut-out art from the Swiss alpine region of “Appenzell”. The twist is that all the design cues were replaced by scenes and symbols that populate daily life in Tokyo — a wonderfully intricate design! Their shirt is available in 2 colours. Paramodel are Yasuhiko Hayashi and Yusuke Nakano, an artist duo from Eastern Osaka formed in 2001. Their graffiti-style rail track landscape art is unique and has made them one of the leaders of the latest generation of Japanese artists and a fixture at art fairs and festivals around Japan. Pingmag has also conducted a lengthy interview with them, another must-read! 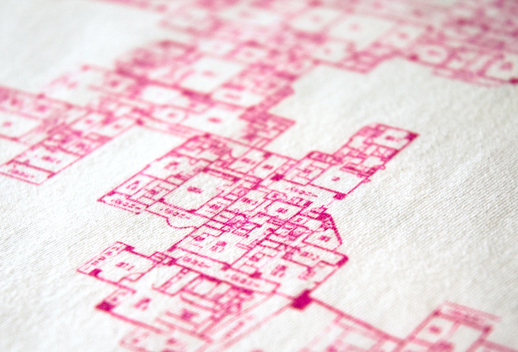 This design is a homage to self-built, self-renovated architecture, like the Sawada mansion complex in Kouchi prefecture, the now-demolished Gunkan apartment block in Osaka, and the Kowloon Walled City in China. Tokyo’s distinctive characteristic lies in the fact that this huge city is made out of dense arrangements of small houses and buildings. We wanted to create a huge “Tokyo” out of these little bits and pieces of apartment layouts. Below is a list of websites that have featured our previous series of TAB Shirts. They are well worth a visit and often feature other cool tees to buy!